His Girl Friday (Howard Hawks, 1940) is a film concerned with modernity. The modern world of His Girl Friday is a world where people can relate to each other only through the use of technology and props. It is a world where technology is rarely used for good. It is a world where technology itself manipulates in order to achieve its own ends. Many writers have expressed concerns about how people relate to each other in modern society. Marx described how technology and machinery mediate between people. More recently it has been said that modernity 'tears space away from place by fostering relations between "absent" others, locationally distant from any given situation of face-to-face interaction. In conditions of modernity, place becomes increasingly phantasmogoric'. In short "Modernity ... changes our notion of space and place." 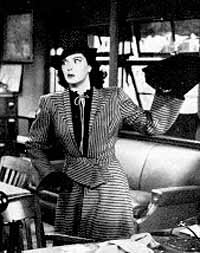 Throughout His Girl Friday technology and props are used by characters to express themselves. They use these devices to say things they cannot say to others, nor admit to themselves. Technology (through the use of phones) is used to create an unseen world of absent others, and the distance created allows for deception. In many instances throughout the film technology alone develops the plot, almost as if it too is a character, with its own personality and its own agenda. 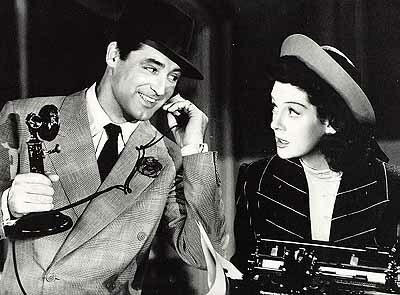 His Girl Friday has many instances of characters using machines and props in order to avoid face-to-face communication. Most obvious, of course, are the telephones used throughout the film. But as we will see later, these phones are used as much more than simple communication devices. At the beginning of the film Hildy's only reason for coming to see Walter, or so she would have him believe, is to ask him to stop calling and sending her telegrams several times a day. We learn that, despite Walter's desire to have Hildy return to work, he has not seen her in person in months. Why could Walter not go to Hildy in person and ask her to return? During the course of their conversation in Walter's office, we learn that Walter hired an airplane to plead "Hildy. Don't be hasty. Remember my dimple. Walter." This is the most extreme example of favoring technological over face-to-face communication. Walter, it seems, prefers to use telephones, telegrams and airplanes to express himself. At the end of the film Walter does not ask Hildy to marry him. Instead he tells Duffy over the phone that they are getting married. Even when Hildy is in the same room Walter uses a phone to propose to her. Hildy too has difficulty communicating. She finds it hard to tell Walter that she is getting married and, in the end, has to use a prop. She takes off her glove and says "It's a ring. Take a good look at it!" Characters use costume and props to express things they cannot admit to themselves and others. Their actions speak louder than, often contradict, their words. For example, despite what Walter says, he is not at all pleased to meet Bruce, since Bruce intends to take Hildy away from him and from the newspaper. Consequently when Walter first encounters Bruce he cannot bring himself to shake his hand. Instead, he shakes Bruce's umbrella. While Walter is trying to persuade Hildy to return to the newspaper, she claims to be disinterested. As she says "You bet I got a better offer" she picks up a mirror and dolls herself up. This, on the surface, seems to clear expression of her disinterest. She prefers domestic things, such as fixing her hair, to Walter's talk of the newspaper business. She prefers seeing Hildy-the-wife to hearing about Hildy-the-reporter. She is clearly not interested. Or is she? When the conversation turns to how Hildy came to be working for Walter in the first place, we learn "Well, you wouldn't have taken me, if I hadn't been doll-faced!" Later, after Walter persuades Hildy to stay and write the most important story of her life rather than deliberating over which train to catch, she agrees saying "I never thought of it like that." Walter responds "You're a doll-faced hick, that's why." A little later when Walter is on the phone and Hildy hears that Sweeny is unable to cover the story she takes out her kit and conspicuously does her make up. Is this a sign that she is disinterested or interested? Is she bored with newspaper business, or is she ensuring that she is doll-faced? Walter seems to think that he can persuade her. When he suggests that she cover the story she immediately replies "No! ", but as he does so she closes the make up case. She proclaims her ambivalence towards the newspaper business but as she does so she discards one of the most obvious symbols of domesticity in the entire film. While in Walter's office Hildy is wearing a flamboyant striped dress and hat [left]. She also has a handbag. Like the mirror and the make up kit this costume symbolizes Hildy-the-wife. It is so much so that despite the fact that she is clearly pressed for time (she must catch the train) she changes her clothes before going to cover the story. Her new costume [right] consists of a more plainly striped jacket (echoing the male reporters' attire) and skirt. The hat she chooses is so conspicuously that of a reporter that one her colleagues comments on it. This is Hildy-the-reporter and nothing remains of Hildy-the-wife, save her purse and long feminine coat. Even though she was pressed for time and her last excursion into world of journalism was supposed to be only two hours long, Hildy made a deliberate decision to change. How serious was she about catching the train on time? Did she expect to stay longer? Was she all to eager to cast off her domestic costume in favor of her reporters' uniform. Hildy's purse and long coat are all that remain of Hildy-the-wife. They are her link to Bruce and to Albany. The purse contains Bruce's money (all they money they have in the world) and the tickets for Hildy, Bruce and Mother to go to Albany. Later after Hildy tears up the story she wrote for Walter she proclaims "and that my friends is my farewell to the newspaper business." She picks up the symbols of her domestic life, the purse and coat, and tries to leave. But she is confused and cannot put her coat on. She starts to put it on backwards and then takes it off. Her coat, it seems, just wont go on. Similarly she can't hang onto her purse for very long and looses it. Hildy's inability to use these props tells us something that she is not prepared to admit to herself or to others. Her domestic coat doesn't fit her as well as her newspaper hat. Her purse is awkward. Not only does she not belong in Albany, but she can't even dress for the part. The world in which His Girl Friday takes place is a world full of 'absent others'. During most of the telephone conversations in His Girl Friday only one of the participants is shown. This is surprising given that the film is all but a monument to classic Hollywood continuity editing conventions. Telephones are very prominent throughout the film, in fact, one of the few tracking shots the film allows itself of the empty pressroom table and its six ringing telephones. Using the telephones characters in different locations can interact with each other and give each other information. This happens a great deal in His Girl Friday. Hildy and Walter talk on the phone frequently. Hildy learns of Bruce's problems over the telephone. In the pressroom phones are constantly ringing. A whole city in chaos is portrayed through the stories reported by the newsmen on the phone. The telephones in His Girl Friday are less than perfect however. Although they allow information to be communicated from place to place they do not allow the recipient to verify the facts. The distance between the characters and the people they call allows for deception. In His Girl Friday there is a great deal of misinformation involving telephones, and much duplicity. Soon after we are introduced to the pressmen they use phones to distort the truth. Bensinger is in the background calling in his commentary while another reporter in the foreground exaggerate everything he says. This exaggeration goes to far as to suggest that the Red Army is leaving Moscow. Much later after Earl Williams is captured in the press room we hear the reporters giving their accounts of the capture. They are clearly exaggerating. This is made blatantly obvious because they report immediately after we have seen the events that they describe. We saw that Williams was not unconscious. We saw that he surrendered peacefully. We saw that is arrest required only a few officers. Clearly what the reporters are saying is not accurate. Even Hildy lies on the telephone - and to Bruce no less. She tells him of an old newspaper tradition of putting one's first big check in the lining of one's hat. It is make clear to the film viewer, through the comments of the other reporters, that this is a lie. Because Bruce is not there, he cannot hear these comments. The distance between him and Hildy created by the telephone allows her to deceive him. Walter deceives Bensinger, using the phone call to Sweeny. He sends Bensinger to the Morning Post office in the belief that he is to work for Walter. Once he leaves the room, however, Walter explains to Sweeny what is to be done with him. Similarly the policeman who have (supposedly) surrounded Earl Williams are absent from the main action and so they too can be deceived. Because they are not in the room with the Sheriff and the Mayor they cannot know that Williams has been reprieved. Thus the Sheriff can order a shoot-to-kill. Once again the telephone is used as an instrument of deception. Many of the characters recognize explicitly that the telephone is a tool of deception. In the opening scene while Hildy is telling Walter that she does not intend to return to the newspaper business he stands facing the camera with a telephone on the table directly in front of him. Walter is clearly concerned and is planning how to make her stay. As he does so he places his hand on the phone. When Hildy becomes more and more critical of the business he places both his hands on the phone and taps it with his fingers. This suggests that he is aware that he can use the telephone to get her back. This is not surprising since it was telephone calls that brought her to his office in the first place. Telephones indeed prove to be very useful to Walter in his efforts to make Hildy stay. He deceives Hildy using the very first phone call of the film. He pretends to be talking to Sweeny when he is in fact talking to Duffy. This is one of the few phone calls for which the film viewer is show both parties to a phone conversation. We are shown shots of Duffy to make it clear that Walter is not talking to Sweeny and is deceiving her. Later Walter talks to Hildy on the phone and learns that Bruce is waiting in a cab outside the criminal courts building. He then covers up the mouthpiece and sends Evangeline to get him arrested. He continues his conversation with Hildy assuring her that he will send her the money she wants, then covers up the mouthpiece so she doesn't hear him arrange for Louie to deliver counterfeit bills. Because the conversation takes place over the phone Walter can control what Hildy hears and thus deceive her. The conversation is not in person so Hildy cannot see that Walter is insincere. Even Earl Williams, who is at the best of times unaware, recognizes that the phone can be used to betray him. Hildy warns him "If I were you, I wouldn't trust anybody either", as she says this she lifts up the ear piece of the phone on the reporters' desk. Williams sees this action as Hildy betraying him and insists "put it back, put it back." Hildy also rocognises the phones as having a role in her deception. After she tears up the Williams story in protest at Walter's scheming, she rips the telephone they speak on out of its connection and throws it on the floor. Careful scrutiny reveals, however, that not all telephones are alike, and not all technology is used to deceive or manipulate. The props left of the reporters' table are distinct from those in the rest of the room. This is the corner where Bensinger's desk is. From the outset Bensinger is portrayed as different from the other reporters. In the opening scene of the press room Bensinger is the reporter who tells the accurate account of events, while another reporter exaggerates his story. He is the reporter who expresses concerns about ethics. It is he who writes the compassionate poem that is ridiculed by Walter. Thus it is not surprising that it is Bensinger's desk that provides a refuge for Earl Williams. His desk and the table next to it, the typewriter and telephone on them are distinct from those in the center of the room. Unlike the harsh reporters' table, this corner of the room is compassionate. When Hildy is concerned for Mother's safety she calls the hospitals from the phone in this corner of the room. This is in stark contrast to the conversation Walter has simultaneously on a phone at the reporters' table during which he calls some woman a "ten cent glamour girl." It was in this corner that Hildy wrote her compassionate story to save Willaims' life. When Bruce calls it is this phone that rings. When the reporter tells the good news of how Williams was not in fact surrounded and shot he calls in the story using the phone on the table next to Bensinger's desk. When Hildy begins her second story she moves the typewriter from the this table to the reporters' table. She then begins her sensational exposé. On the 'compassionate' table the typewriter was used to save Earl William's life. On the reporters' table it is used to ridicule the sheriff and boast about William's capture by the Morning Post. The knowledge that these tables are distinct can provide some insight into Hildy's other actions. After she catches Williams she calls Walter from the reporters' table saying "Get me Walter Burns quick. I need him." The phone discussed above rings and she has to get up to answer it. It is Bruce calling from jail. Because the phones are on different tables she has to decide where to sit. She must chose between the table where Bruce's phone is and the table Walter's phone is on. Her choice is revealing. She picks up Bruce's phone and returns with it to the table from which she called Walter. This choice of where to sit is symbolic of her choice between Bruce and Walter. The dialogue which follows confirms this as she explains to Bruce that she can't get him out of jail right away because "something wonderful has happened." She must cover the story or rescue Bruce. By the time she took the only phone in the room that had ever done any good and put in on the table with all the other phones she had already made up her mind. How Hildy is a reporter just like all the others. Recall that, a great many of the telephone conversations in His Girl Friday have only one visible participant. This begs the question who are the characters talking to? Could it be to the technology itself that they are speaking? Can the technology be viewed as a character? I would argue that this could well be the case and that His Girl Friday is an essay in Anthropomorphization. Despite Walter's scheming, most of the plot is developed by the props themselves. When Hildy and Williams are alone together in the pressroom the blind suddenly rolls up causing Williams to shoot out the window. As a result of this shot the reporters and police are expected to arrive soon. Diamond Louie spirits Mother away in a cab, but the automobile crashes and delivers Mother into the hands of the police. When it seems that Hildy and Walter are going to be successful in concealing Williams the Sheriff's gun falls out of Hildy's purse, exposing her. The newspaper world of His Girl Friday is a world of living machines. Hildy wants to escape from this world but it will not let her go. Hildy tries to leave on a number of occasions but these living machines keep her there. When Hildy tells the press men that she is leaving the newspaper business a fire bell rings off screen as if to test her. She fails and her enthusiasm for the business is apparent. Then the sound of the gallows remind her why she is there. After Hildy tears up the Williams story, she tries to leave the pressroom. But she does not make it out the door. Off screen the sound of machine gun fire and bells stops her in her tracks. Indeed one could view the whole film as motivated by machinery. The airplane which Walter sent delayed their divorce. The telephones and telegraph machines brought her to Walter's office. The telephones and the sound of the gallows lead her to the criminal courts building. Once there, the telephones and Sheriff Hartwell's gun prevent her from leaving. When Bruce enters in the last scene to take her off to Albany she is busy typing and all but ignores him. She is totally caught up in the story. Bruce pleads with her as Walter, disinterested, rearranges the front page. Although Walter's newspaper and Bruce and Hildy's conversation are separate dialogues, the timing is arranged such that it makes an interesting juxtaposition. Bruce : "You don't want to come with me do you?" Hildy : "Can't you see this is the biggest thing in my life"
Bruce : "And I'm something in the ice box ain't I"
Bruce : "I don't think you ever loved me at all"
Walter is not paying attention to Bruce and Hildy's conversation. It is as if the newspaper itself, through the business of the front page, is, like a jealous lover, trying to get Bruce to leave without her. It is as if the newspaper itself, unknown to Walter, is answering Bruce's questions. In the anthropmorphized world of His Girl Friday machines make noise. The newspapers and telephones tell news of places and people unseen. They deliver information to and from people not shown on screen (the one sided telephone conversations). The machinery in His Girl Friday talks and is talked to. It is not surprising that Hildy chooses not to go to Albany. Consider her choice. She can stay in the press room or leave with Bruce. She can stay in a world preoccupied with the short term (news, deadlines), so dynamic it can save lives and ruin crocked politicians, so animated, that even the machines are alive, or she can go to Bruce's world which is concerned primarily with death. Bruce's world is without spontaneity. It is a world concerned with planning, where he carries an umbrella in case it rains. It is a world concerned with years from now. It is a world which "doesn't help you much while you're alive." Hildy chooses to stay in the land of the living. Hildy and Walter are not so much in love with each other as with the newspaper. One could almost argues that it is useful to view Hildy and Walter not as a couple, but as two partners of a menage a trios. The newspaper, the third partner, is clearly the winner in this relationship. Much ado is made about Hildy and Walter being the best team of reporters in the business. It is clearly in the interests of the newspaper that they stay together. Fortunately however the relationship between Hildy and Walter cannot exist without the newspaper, but just to make sure they don't get too close it comes between them on their honeymoon. Both honeymoons in fact. In closing it can be said that technology clearly plays an important part in His Girl Friday. Sikov tells us that 'America became obsessed with its own culture during the thirties.... In a self fulfilling sort of way, Hollywood was right: like the film studios themselves, the global communications networks ... were giving the United States an unassailable monopoly on information and its speed." The question we must ask, however, is what is His Girl Friday trying to say? At best the technology in the film is a tool which deceitful people can use to deceive, a tool with which the dishonest can dispatch their dishonesty. At worst the technology itself is evil, and men and women are helpless in the face of it. The most useful reading lies, perhaps, somewhere in between these extremes. I have tried to suggest in this paper that looking at how characters interact with props can provide interesting readings. In His Girl Friday, in particular, it allows us to see how Hildy is predisposed to communicating using props (ring, costume, purse), and through her use of props we can trace her slow but sure seduction back to the newspaper business. We can even see the precise moment at which she chooses it over Bruce. What His Girl Friday is trying to say about modernity is as open to interpretation as Hildy's and Walter's relationship. Is Hildy manipulated into doing something she does not want to, or is she an accomplice to her own salvation? Is technology in the modern world a sinister antonymous force, or is it simply a tool that does the biding of men and women? Clearly His Girl Friday has something to say. Paper written by Colin Manning for Course Film50 at U.C. Berkeley 1993.